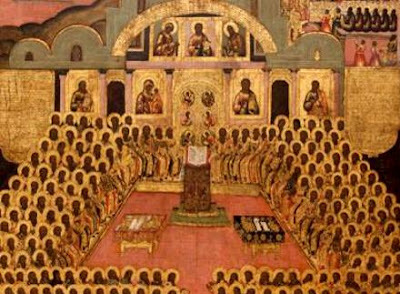 On the Sunday that falls between the 13th and 19th of this month [July], we commemorate the Holy Six Ecumenical Synods, namely the 318 God-bearing Fathers of the First Synod who gathered in Nicaea against Arianism in the year 325; and the 150 of the Second Synod who came together in Constantinople against the Pneumatomachs in the year 381; and the 200 at the Third who came together in Ephesus against Nestorius in the year 431; and the 630 at the Fourth in Chalcedon who came together against the Monophysites in the year 451; and the 165 of the Fifth Synod who came together against Origen and his followers in the year 553; and the 170 of the Sixth who came together in Constantinople against the Monothelites in 680. According to the notes of Saint Nikodemos the Hagiorite for this commemoration, there is a discrepancy on this day as to whether we should celebrate the Six Ecumenical Synods or just the Fourth Ecumenical Synod, while the Canon of Philotheos chanted on this day only refers to the Fourth and the Sixth Ecumenical Synods which were against the Monophysites and the Monothelites. Instead of this Canon, however, it is the Canon of Germanos the New which should be chanted on this day, being the same chanted on the Sunday after October 11th when we commemorate the Seventh Ecumenical Synod, because it refers to all Seven Ecumenical Synods. It is more fitting for this Canon to be chanted today rather than after October 11th, because on the Sunday after October 11th only the Seventh Ecumenical Synod is commemorated and not all Seven. Moreover, it was the tradition in the days of Saint Nikodemos to chant the Canon of Germanos the New on this day rather than that of Philotheos. This being the case, it would be more fitting on this day to celebrate all Seven Ecumenical Synods rather than just the Six. As for the Fourth Ecumenical Synod being alone commemorated on this day in some sources, Saint Nikodemos clarified that this was because of the miracle of Saint Euphemia at the Fourth Synod which the Church celebrates on July 11th. In his editing of the Synaxaristes, Saint Nikodemos listed the commemoration for the Fourth Ecumenical Synod to take place on the same day as the miracle on July 11th, while this Sunday should commemorate the Six Ecumenical Synods, although it would be more fitting to commemorate all Seven on this day according to the order of the Canon of Germanos the New. The fact that the Seventh Ecumenical Synod is not commemorated today testifies to the antiquity of today’s celebration. To clarify, all Seven Ecumenical Synods are commemorated separately on their own particular day: the First Synod is celebrated on the Sunday after the Ascension, the Second on May 22, the Third on September 9, the Fourth on July 11, the Fifth on July 25, the Sixth on September 14, and the Seventh on the Sunday after October 11. "That order is best of all which makes every word and act begin and end in God. Wherefore that piety may be clearly set forth by us and that the Church of which Christ is the foundation may be continually increased and advanced, and that it may be exalted above the cedars of Lebanon; now therefore we, by divine grace at the beginning of our decrees, define that the faith set forth by the God-chosen Apostles who themselves had both seen and were ministers of the Word, shall be preserved without any innovation, unchanged and inviolate. 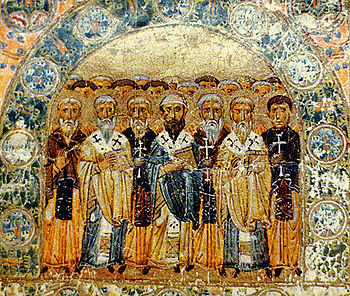 Moreover the faith of the three hundred and eighteen holy and blessed fathers who were assembled at Nicaea under Constantine our Emperor, against the impious Arius, and the gentile diversity of deity or rather (to speak accurately) multitude of gods taught by him, who by the unanimous acknowledgment of the faithful revealed and declared to us the consubstantiality of the Three Persons comprehended in the Divine Nature, not suffering this faith to lie hidden under the bushel of ignorance, but openly teaching the faithful to adore with one worship the Father, the Son, and the Holy Spirit, confuting and scattering to the winds the opinion of different grades, and demolishing and overturning the puerile toyings fabricated out of sand by the heretics against orthodoxy. Likewise also we confirm that faith which was set forth by the one hundred and fifty fathers who in the time of Theodosius the Elder, our Emperor, assembled in this imperial city, accepting their decisions with regard to the Holy Spirit in assertion of his Godhead, and expelling the profane Macedonius (together with all previous enemies of the truth) as one who dared to judge Him to be a servant who is Lord, and who wished to divide, like a robber, the inseparable unity, so that there might be no perfect mystery of our faith. And together with this odious and detestable contender against the truth, we condemn Apollinaris, priest of the same iniquity, who impiously belched forth that the Lord assumed a body unendowed with a soul, thence also inferring that his salvation wrought for us was imperfect. Moreover what things were set forth by the two hundred God-bearing fathers in the city of Ephesus in the days of Theodosius our Emperor, the son of Arcadius; these doctrines we assent to as the unbroken strength of piety, teaching that Christ the incarnate Son of God is one; and declaring that she who bare him without human seed was the immaculate Ever-Virgin, glorifying her as literally and in very truth the Mother of God (Theotokos). We condemn as foreign to the divine scheme the absurd division of Nestorius, who teaches that the one Christ consists of a man separately and of the Godhead separately and renews the Jewish impiety. Moreover we confirm that faith which at Chalcedon, the Metropolis, was set forth in accordance with orthodoxy by the six hundred and thirty God-approved fathers in the time of Marcian, who was our Emperor, which handed down with a great and mighty voice, even unto the ends of the earth, that the one Christ, the son of God, is of two natures, and must be glorified in these two natures, and which cast forth from the sacred precincts of the Church as a black pestilence to be avoided, Eutyches, babbling stupidly and inanely, and teaching that the great mystery of the economy was perfected in thought only. And together with him also Nestorius and Dioscorus of whom the former was the defender and champion of the division, the latter of the confusion [of the two natures in the one Christ], both of whom fell away from the divergence of their impiety to a common depth of perdition and denial of God. Also we recognize as inspired by the Spirit the pious voices of the one hundred and sixty-five God-bearing fathers who assembled in this imperial city in the time of our Emperor Justinian of blessed memory, and we teach them to those who come after us; for these synodically anathematized and execrated Theodore of Mopsuestia (the teacher of Nestorius), and Origen, and Didymus, and Evagrius, all of whom reintroduced feigned Greek myths, and brought back again the circlings of certain bodies and souls, and deranged turnings [or transmigrations] to the wanderings or dreamings of their minds, and impiously insulting the resurrection of the dead. Moreover [they condemned] what things were written by Theodoret against the right faith and against the Twelve Chapters of blessed Cyril, and that letter which is said to have been written by Ibas. Also we agree to guard untouched the faith of the Sixth Holy Synod, which first assembled in this imperial city in the time of Constantine, our Emperor, of blessed memory, which faith received still greater confirmation from the fact that the pious Emperor ratified with his own signet that which was written for the security of future generations. This synod taught that we should openly profess our faith that in the incarnation of Jesus Christ, our true God, there are two natural wills or volitions and two natural operations; and condemned by a just sentence those who adulterated the true doctrine and taught the people that in the one Lord Jesus Christ there is but one will and one operation; to wit, Theodore of Pharan, Cyrus of Alexandria, Honorius of Rome, Sergius, Pyrrhus, Paul and Peter, who were bishops of this God-preserved city; Macarius, who was bishop of Antioch; Stephen, who was his disciple, and the insane Polychronius, depriving them henceforth from the communion of the body of Christ our God. But if any one at all shall not observe and embrace the aforesaid pious decrees, and teach and preach in accordance therewith, but shall attempt to set himself in opposition thereto, let him be anathema, according to the decree already promulgated by the approved holy and blessed Fathers, and let him be cast out and stricken off as an alien from the number of Christians. For our decrees add nothing to the things previously defined, nor do they take anything away, nor have we any such power." Glorious art Thou, O Christ our God, Who hast established our holy fathers as stars on earth. Through them Thou dost guide us to the true faith. O Most Merciful One, glory to Thee.